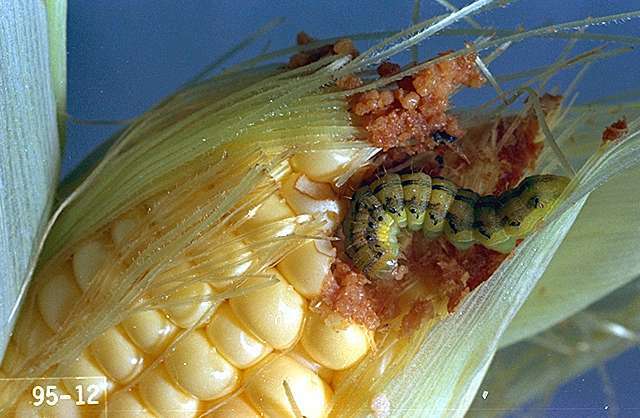 Many predators and parasites attack corn earworm eggs, including several species of Trichogramma. Most parasitized eggs turn black, but there may be a lag period before they do so. Commercial releases of Trichogramma wasps have been used with mixed results. 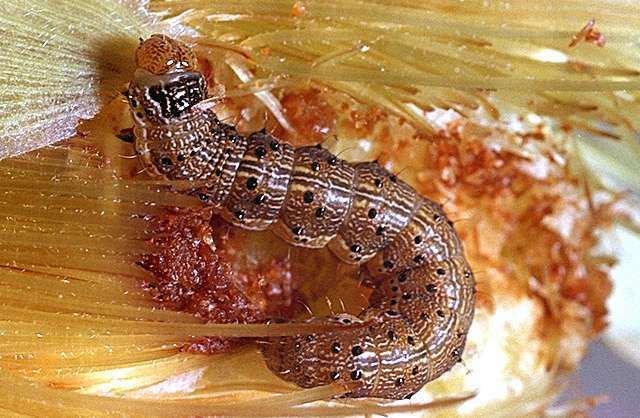 Generalist predators such as lacewings, minute pirate bugs, and damsel bugs feed on corn earworm eggs and small larvae. HCNPV (Gemstar LC) at 4 to 10 fl oz formulated product. PHI 0 days. REI 4 hr. 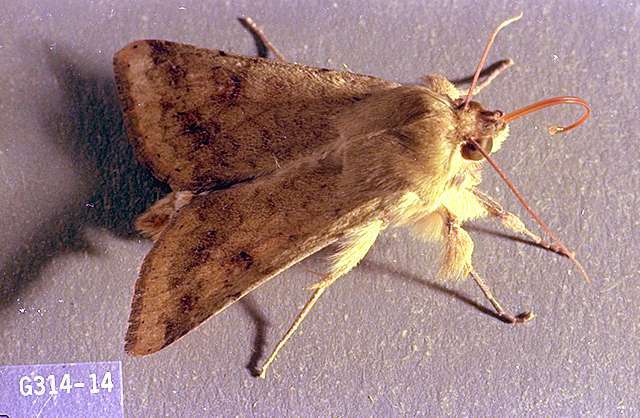 A liquid concentrate biological insecticide for control of corn earworm. azadirachtin (neem oil)-Some formulations are OMRI-listed for organic use. plant essential oils (rosemary, etc. )-Some formulations are OMRI-listed for organic use. pyrethrins (often combined with other ingredients)-Some formulations are OMRI-listed for organic use. spinosad-Some formulations are OMRI-listed for organic use. acephate (numerous products) at 0.75 to 1 lb/a. PHI 14 days. REI 24 hr. Do not feed treated vines. Do not exceed 2 lb ai/a per year. beta-cyfluthrin (Baythroid XL, Tombstone Helios) at 0.0019 to 0.025 lb ai/a. PHI 7 days. REI 12 hr. Retreatment interval 14 days. Do not exceed 0.05 lb ai/a per season. Do not feed treated vines or hay to livestock. Toxic to bees, fish and aquatic invertebrates. carbaryl (Sevin) at 0.5 to 1.5 lb ai/a. REI 12 hr. PHI 3 days for harvest of succulents, 21 days for harvest of dried, 14 days for forage, and 21 days for hay. Do not exceed 6 lb ai/a per crop. Toxic in aquatic habitats. Do not apply carbaryl dust to blooming weeds because of severe hazard to pollinating bees. Latex-based formulations, such as Sevin XLR Plus, are less hazardous to bees. chlorantraniliprole (Coragen) at 0.045 to 0.065 lb ai/a. PHI 1 day. REI 4 hours. Do not exceed a total of 15.4 fl oz of chlorantranilprole per season. chlorantraniliprole/lambda-cyhalothrin (Voliam Xpress) at 0.059 to 0.088 lb ai/a. PHI 21 days. REI 24 hr. Retreatment interval 5 days. Do not exceed 0.12 lb ai of lambda-cyhalothrin or 0.2 lb ai of chlorantraniliprole per acre per growing season. Do not graze livestock or harvest vines for forage or hay. cyfluthrin (Renounce) at 0.038 to 0.05 lb ai/a. PHI 7 days. REI 12 hr. Retreatment interval 14 days. Do not exceed 0.1 lb ai/a per season. Do not feed treated vines or hay to livestock. Toxic to bees, fish and aquatic invertebrates. esfenvalerate (Asana) at 0.03 to 0.05 lb ai/a. PHI 21 days. REI 12 hr. Do not exceed 0.2 lb ai/a per year. Do not feed or graze treated vines. gamma-cyhalothrin (Proaxis) at 0.01 to 0.015 lb/a. PHI 21 days. REI 24 hr. Do not apply within 25 ft of an aquatic habitat, 150 ft if applied by air. Do not graze. Do not exceed 0.06 lb ai/a per year. lambda-cyhalothrin (Warrior II) at 0.02 to 0.03 lb ai/a. PHI 21 days. REI 24 hr. Do not graze or feed to livestock. Do not exceed 0.12 lb ai/a per year. Do not apply within 25 ft of an aquatic habitat, 150 ft if applied by air. methomyl (Lannate) at 0.45 to 0.9 lb ai/a. PHI 14 days for harvest, feeding vines, and hay. REI 48 hr. Do not exceed 4.5 lb ai/a per year. spinetoram (Radiant SC) at 0.0313 to .0625 lb ai/a. PHI 28 days. REI 4 hr. Retreatment interval 4 days. Do not exceed six applications or 0.094 lb ai/a per season. Follow resistance management procedures on the label. spinosad (Success) at 0.06 to 0.09 lb ai/a. PHI 28 days. REI 4 hr. Treat eggs at hatch and small larvae. Do not exceed 0.19 lb ai/a per year. Do not feed forage or hay to livestock. Spinosad takes several days to achieve full effect. Monitor fields and pest populations carefully. Multiple applications may be necessary. Some formulations are OMRI-listed for organic use. zeta-cypermethrin (Mustang; Mustang Max) at 0.017 to 0.025 lb/a (Mustang Max) or 0.035 to 0.05 lb ai/a (Mustang). PHI 21 days. REI 12 hr. Retreatment interval 5 days. Do not exceed 0.15 lb ai/a (Mustang Max) or 0.3 lb ai/a (Mustang) per year. Do not apply within 25 ft of an aquatic habitat, 150 ft if applied by air.